I almost thought I might just skip the last two days of this week’s BM. We had an unexpected tour that came up and I was left without any choice in leaving the theme half way. There was no way I could make the samosas as I planned as I was already in need to make something for my nieces and nephew. I managed to make one version and was so sad that I had to miss the two. In every edition, there is always one theme that I like very much and in this edition it happens to be Samosas. Being so fond of this snack, I wanted to try out different fillings and knew I would make something with chocolate as well. I actually had fudge in mind, but as things went, I didn’t make anything. This morning I happened to read this recipe and knew this is something that’s so easy to make, that I might as well make it. As expected kids simply loved it and wanted more. Unfortunately the Phyllo sheets that I had were not long. So I had to struggle in making a proper triangle. Anyway this is a recipe that gets done in short 15 mins, if you have the ingredients with you. The spring roll wrappers that I had stocked was bought for another theme that I never did, I was eagerly waiting for a chance to use them. Though I never expected them to be square. With long sheets these mini samosas turn out so well. In a small bowl, mix the flour and water to make a smooth paste. Cut the spring roll wrappers, which will be square, into thin strips. Since mine were small squares, it was quite complicated to get the triangle shape. Fold the end of one strip over to form an equal-sided triangle, then fold over again, maintaining the triangle shape. Lift it up and spoon a bit of Nutella into the pocket. Alternatively you could drop a small spoonful onto the end of the strip as it lays on your work surface, then fold it over to make a triangle and continue from there. Continue folding back and forth, maintaining the triangle shape. When you get close to the end, brush the last piece of the strip with some paste and seal it closed. If there are holes in any of the three tips, seal them with a bit of paste. In a Kadai, heat oil. 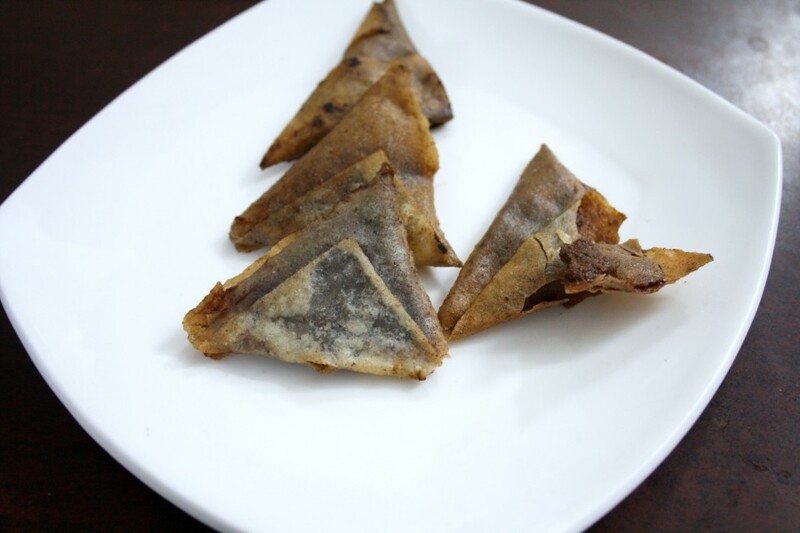 Fry a few samosas at a time, without crowding the pot, flipping as necessary as they turn brown. Remove with tongs or a slotted spoon to paper towels to drain. If you want you can sprinkle with sugar and serve warm. With long strips, you will get a thicker outer layer, since mine was small, there was only a single outer layer and so the nutella was seen clearly. 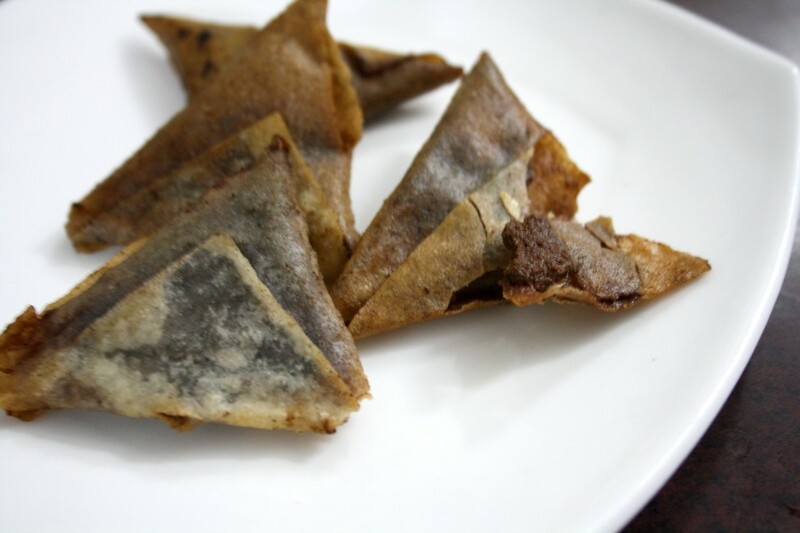 Nutella in a samosa, now that is one yummy & delicious one.. L=Sounds too tempting..
and I thought perfect candidate for the Indian fusion with chocolate theme next month! samosa with nutella! !wow,loved the idea,very innovative! My kid's favourite samosas, nutella in samosa even grown up kids like me wont say no. Very unique valli,This will be a super hit with kids!!! hmm thats is so sinful or us & a wonderful treat for the kids. That sounds so delicious, super likes. Very interesting idea! Chocolate lovers would love it! It's unique one, kiddos will love this. what a nice and delicious twist to the regular samosas… that is surely kid's friendly… Thanks for linking it to my event!! Looking for more yummy recipes! !